Can you crush on your sister’s boyfriend and not piss her off? 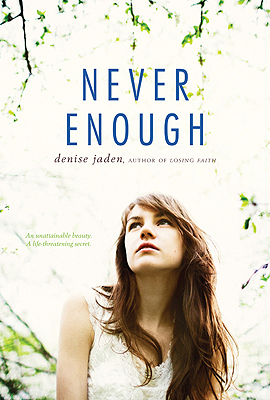 It seems like it would be long road back to sibling bliss, and that’s exactly what you’re going to find out in GCC member Denise Jaden’s new book, NEVER ENOUGH, published this month through Simon Pulse. Denise: I think I’ve only been in one wedding, and that was for my best friend in high school. The dress wasn’t bad—for the eighties! Denise: I first started writing Never Enough because a good friend of mine was struggling with a severe eating disorder, and I wanted to understand her better. The older sister in the book is not based off of this girl, but there are definitely a few personality traits of hers that are similar. The love interest, Marcus, was loosely modeled after my best guy friend from high school, though our relationship was always completely platonic. Denise: Finding an agent was much harder for me. I queried three different manuscripts over several years. When Losing Faith was finally ready, the agent search went much quicker (about three months, I think) and finding an editor for Losing Faith was even quicker than that. Denise: As I mentioned, I had a friend with a severe eating disorder. The novel started out as more of an exploration of emotional stress than a story with a beginning, middle, and end, but I guess I’m a storyteller at heart, because it quickly developed into one. Denise: To be honest, I don’t remember much of the process of this latest book, mostly because the email came in during the flux of my debut novel releasing. My editor wanted to speak with me about some in-depth changes before making a deal, so it was a bit of a long process before I could actually say that the book was on its way to publication. The first time I announced it was at my launch party for Losing Faith, but even then, I think I had to tell people not to announce it online yet. Also, leave a comment on my blog for a chance to win four boxes of books from Denise! Anyone who comments here will automatically be eligible to win. Here is the link to Denise’s blog post, which will tell you more about it.